Una nueva editorial adquiere una licencia sobre Call of Cthulhu. Stygian Fox (web en construcción) es una nueva editorial formada principalmente por Steff. J. Worthington y Jeffrey Moeller, de los que ya habréis oído hablar en varias ocasiones. Han adquirido de Chaosium una licencia para Call of Cthulhu y su primer lanzamiento previsto se llamará The Things We Leave Behind. Stygian Fox Publishing (SFP) and Chaosium, Inc. proudly announce an agreement allowing Stygian Fox to begin publishing official Call of Cthulhu role-playing game supplements. While we have no firm release dates at present, but we're hoping the first book will appear at your FLGS, Chaosium's site, and our own site before the end of Q3 2013. 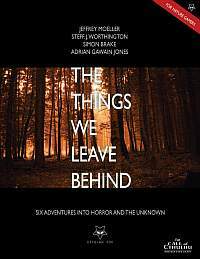 'The Things We Leave Behind' is our first book and will be a collection of modern day scenarios veering in a darkly disturbing direction. We want to bring Cthulhu adventures, specifically modern ones, to a more mature audience and back to it's horror roots. We will aim to shock and horrify your players and much of our material will be geared at mature gamers. They will deal will with difficult and horrific subjects such as abductions, murder, and the stark knowledge that mankind itself can be more cold and calculating than anything from time & space. Seguramente les pareció pobre preparar la nota de prensa sin mencionar siquiera un título que piensen sacar. Van de temática para adultos, ¿no? Suena curioso. ¿Cuándo la llamada fue para críos? Varios escenarios de Pagan eran para jugadores adultos, por ejemplo los de Mortal Coils . Ladybug, Ladybug, Fly Away Home, by Jeff Moeller. The security camera-captured abduction of a sick, five year old girl from a busy big box store, leaving behind the plushie backpack that her medication pump is carried in, captures the attention of the tabloid television industry, and the F.B.I.’s Missing and Exploited Children Task Force. Karen, a 15 year old tomboy, has gone missing from a camping trip near the town of Geverlon, leaving behind a secret letter from her birth mother encouraging her to come for a visit. But where have all the men in town gone? The Night Season, by Jeff Moeller. Several years ago, Bobby Horn, a 17-year old jock, left behind a bizarre, rambling suicide note full of references to pop culture television shows that he had no interest in, as well as other, darker things. The closer that the investigators get to the truth, the more reality begins to unravel. The House of Lost Stories, by Steff. Worthington. For years there have been rumours about the Fowler House. Spooky stories told by the local kids who'd just walk past it on a dare. The truth of that old house on the hill is darker than anyone expects. Bueno, siento que a Escu no le caen muy bien los tíos estos, o ha leído los escenarios ya. A mi me parece interesante que sean one shot y sean temáticas bien pesaditas. Yo con mis hijos juego Pathfinder y Estarguars. Cri, cri, cri... la última novedad en su web es de diciembre de 2012. En su FB hay una nota dle acuerdo (enero), un anuncio de producto (tabla de críticos, genérico) y otro de que ya tienen web (marzo), y en julio hay dos de que venden láminas de Steff Worthington (el dueño vaya, el que hace últimamente los mapas de CHA). Este tipo de empresas requieren de cojones para salir adelante. No es tarea fácil.